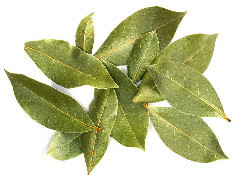 Bay leaves come from the laurel (or bay) tree, a native of the Mediterranean region. Traditionally used in making wreaths for victors, the bay has come to be a symbol of success. This herb has an ancient reputation for enhancing life and encouraging health and happiness. Fresh or dried bay leaves are used in cooking for their distinctive flavor and fragrance. The leaves are often used to flavor soups, stews, braises and pâtés in Mediterranean cuisine. The fresh leaves are very mild and do not develop their full flavor until several weeks after picking and drying. Taste and Aroma:If eaten whole, bay leaves are pungent and have a sharp, bitter taste. As with many spices and flavorings, the fragrance of the bay leaf is more noticeable than its taste. When dried, the fragrance is herbal, slightly floral, and somewhat similar to oreganoand thyme. Myrcene, which is a component of many essential oils used in perfumery, can be extracted from the bay leaf. Bay leaves also contain the essential oil eugenol. Culinary uses:Bay leaves are a fixture in the cooking of many European cuisines, as well as in North America. They are used in soups, stews, meat, seafood and vegetable dishes. The leaves also flavor many classic French dishes. The leaves are most often used whole and removed before serving. In Indian and Pakistani cuisine bay leaves are often used in biryani, other rich spicy dishes - although not as an everyday ingredient in home cuisine - and as an ingredient in garam masala. Only one leaf is necessary to give a special flavour to meals, and it should be removed after cooking. A bay leaf should be included in white sauces, and also gives a distinctive flavour to milk puddings. Storage: Bay Leaves will keep for up to 2 years when stored in an airtight container.